Abarth has revealed two new versions of their successful ‘500’ hatchback city car, 595 versions, the Turismo and Competizione. The Abarth 595 Turismo (pictured) houses a 160bhp (v the 500’s standard 135bhp) engine and adds aluminium trim and pedals. There’s new floor mats, tinted windows, sports suspension, 17” alloy wheels and xenon headlamps. There’s eye-catching front and rear grilles, equally eye-catching red brake callipers and a choice ten new colourways. At £17,725 for manual transmission, hard top it’s not cheap, but it looks great. The Abarth 595 Competizione gets everything above plus cross-drilled brakes, Monza exhaust, prettier alloys and the same choice of colours. For the added bells and whistles you’ll pay £18,725. 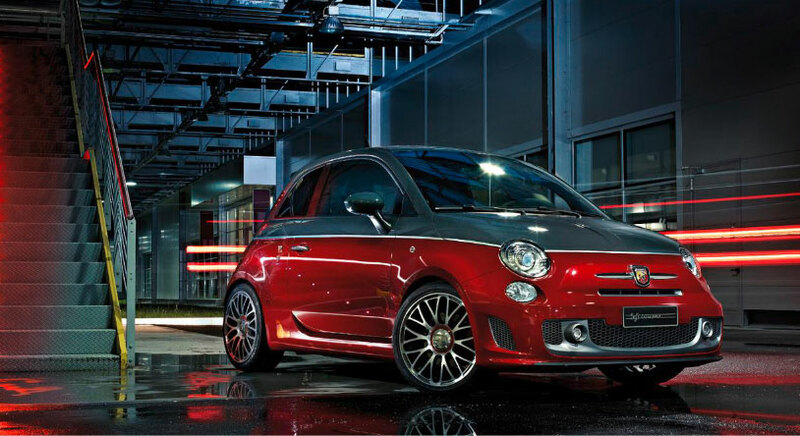 In other news, Abarth have announced they will drop the price by £500 to £13,795. What do you get for your money? 1.4 litre turbo-charged engine producing 135bhp, or 140bhp in the semi-auto. There’s air-con, 16” alloys, rear sensors and front fogs. Extras? Part with £1,900 and you’ll get a soft-top across the range, £1,300 and you’ll get a semi-auto paddleshift – that’s on the 500 or 595.